agileBase keeps stats of every important action, like a login, record creation, report view, data edit or report modification. There are a number of places you can see this information. As an administrator, there’s a ‘dashboard’ button in the toolbar that loads a fullscreen map of all the areas of an organisation. Each module is an area of the screen and each view is a sub-section. Big areas for those that get a lot of use, smaller for those that don’t. 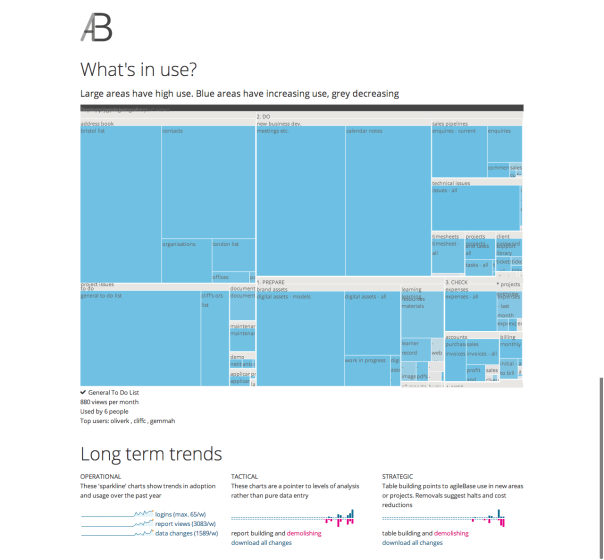 Colours give immediate feedback on whether it’s usage is increasing (dark blue = getting more use) or decreasing (light gray = cooling). Hovering over an area shows more stats including the top users. If you have many views, you can zoom in on individual modules or sections by clicking on titles. Hovering over a view shows details such as the top users and the last month’s usage. As one user said, “If I have understood you correctly you monitor the actual use of information? That seems like a very good idea to me as it is one of the ways to find out what information (in the system) actually matters most to the organization. That really helps setting priorities for future development”. ‘Sparkline’ graphs are used to highlight particular types of usage in three areas – operational, tactical and strategic. Clicking on the name (e.g. data edits) next to a sparkling will load a detailed spreadsheet of every access of that type, useful for audit or rollback purposes. Finally, to see a summary of who’s looking at a particular view, select that view’s manage tab (you’ll need MANAGE privileges). The stats button will show the last use by each user together with a count of total accesses by that user. This is useful to see if views are actually being used or whether they need to be altered or removed for example. Sometimes, agile development can create a glut of views, some of which are eventually found unnecessary or become obsolete over time. Similarly, you can see a summary for each table, to show details of who’s looking at any view that draws data from that table. Usage stats are kept for one year (more in backup).